Chillagoe, a once booming mining town is 140 km west of Cairns. In 1874 the Walsh River area, north-west of Chillagoe, was prospected by James Mulligan, but without making any significant mineral discovery. Nine years later Mulligan was commissioned by John Moffat, the Herberton mining entrepreneur, on another investigation, and found showings of copper minerals. The timing was good, as world copper prices were high, and in 1887 Moffat sent in another prospecting party. A pastoral entrepreneur, William Atherton, anticipating westwards mining ventures, took up a pastoral station for the supply of meat, choosing a site on the Chillagoe Creek. Moffat secured numerous mineral-area leases. The Chillagoe minerals field extended 15 km west to Mungana (see separate entry) and 10 km east to Calcifer, where Moffat established a mine and smelters in 1884. He also had a mine and smelters at Muldiva, 25 km south-east of Chillagoe, but its isolation pushed up costs and production ceased in 1893. Isolation could be overcome with a railway, and plans were laid for a line from Chillagoe to Mareeba, connecting with the Cairns railway line, and for a better performing electrolytic smelter at the Barron Falls. Both proposals ran into difficulty in the Queensland Parliament: the railway line finally gained approval, opening in 1900, but the proposal for the Barron Falls smelter was defeated. Smelters were therefore built at Chillagoe, with a consequent heavy cost for transporting coal inland. The Chillagoe smelters were blown in September 1901. Within a few months the venture seemed to be profitable, and several directors of Chillagoe Pty Ltd offloaded their shares in a bullish market, knowing that the venture was ultimately doomed. The smelters were closed in December 1901. In 1906, in a search for mineral deposits to overcome the shortage of ore reserves around Chillagoe, a private railway was mooted from the Chillagoe line south to the Etheridge copper and gold deposits. The line opened in 1909. The Chillagoe smelters were reactivated profitably, but flooding and fire damage closed operations in 1914. Despite good metals prices during World War I the Queensland government prevaricated, finally acquiring the smelters in 1919. Ore was shipped in, some from Mount Isa, mainly with the Labour government's objective of providing government-sponsored employment in postwar far north Queensland. Both the Treasurer, Ted Theodore, and the Premier, William McCormack, had been union organisers at the Mungana mining field. Each was entrapped in allegations about their financial dealings in the late 1920s in Mungana, all of which were disproved. 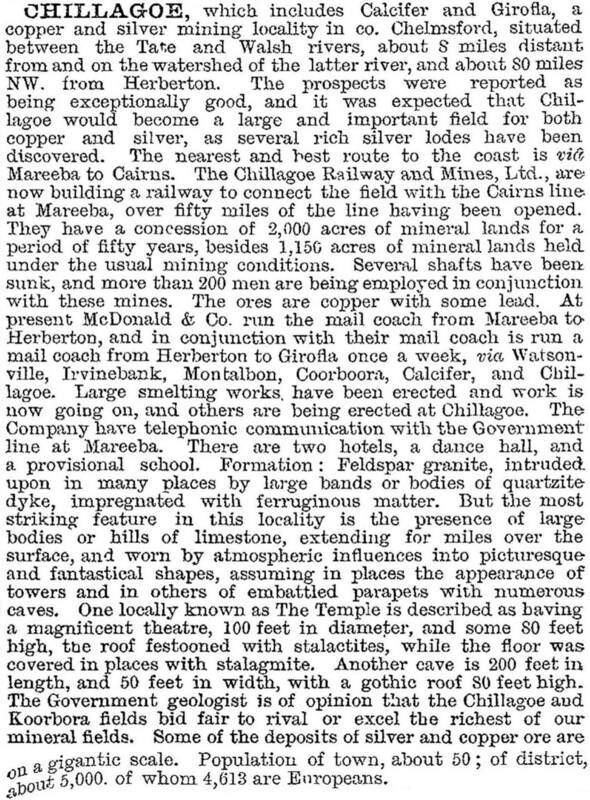 Fortunately Chillagoe's fortunes were not tied solely to mining. William Atherton's pastoral investment was prescient, and the railway carried mixed freight, including metals to Cairns harbour and livestock to the Mareeba saleyard. The population varied with the scale of mining and the peak year was probably 1917, with about 10,000 people, 13 hotels, two newspapers and a hospital. Pugh's Queensland Directory in 1925 recorded six hotels, five storekeepers, two drapers and several tradespeople in Chillagoe. A Catholic primary school continued until 1927. During the 1930s and continuing until 1943, subsidised railway freight rates transported ore to the Chillagoe smelters, but lack of manpower during wartime and competition from Mount Isa forced their closure. Small amounts of mining for tin, molybdenum, wolfram and fluorspar continued, and Chillagoe marble continues to be quarried. The marble is a geological sample of the extensive cave systems south of the town. Less than 2 km away are four caves in a national park, and further south is the Royal Arch Cave national park. North of the town on a dominant hill is the smelter chimney; between 1901 and 1943, the smelter complex produced 60,000 tonnes of copper, 50,000 tonnes of lead, 6.5 million ounces of silver and 175,000 ounces of gold. Over 1000 people were employed during peak production. The national parks and the smelter reserve are on the Australian heritage register. Chillagoe has developed tour activities around the caves and the smelter reserve, and in May each year holds a rodeo and races at the racecourse. There are three caravan parks, two hotels and other accommodation, along with a mining museum. Government services include a primary school (1902), hospital/clinic and a national parks office. In 2004, as a tribute to mining pioneers, the 149 km road between Mareeba and Chillagoe was named the Wheelbarrow Way and hosts an annual wheelbarrow race. In December 1908 Chillagoe Shire, an area of 2430 sq miles, was proclaimed. Before then the area had been in Woothakata (later Mareeba) Shire. It had an estimated population of 3000, distributed among the mining towns of Almaden, Calcifer, Cardness, Mungana, OK Mine and Zillmanton. In April 1932 Chillagoe Shire was re-united with Woothakata Shire. Its census populations had been 2424 (1911) and 1125 (1921).